Remember torsions and versions? If not, click here, here, here and here for a review. In the top left view, you are seeing the left foot in a neutral posture with the knee in the (relative) midline. Notice how the foot adducts? This person has INTERNAL TIBIAL TORSION. They also have hammer toes and a cavus (high) arch. In the top right, the foot is again in a neutral posture and the R foot is adducted EVEN FARTHER. Again, internal tibial torsion along with hammer toes and a cavus foot. For a hint, look at the tibial tuberosity; it should line up with an imaginary line drawn through the 2nd metatarsal. In the middle left picture I am fully internally rotating the R leg. Hmm, no internal rotation of the hip (note the knee goes little beyond midline). You need 4 degrees of internal rotation of the hip to walk normally and most folks have 40 degrees. This person has FEMORAL RETROTORSION. In the middle right picture I am fully internally rotating the L leg. Hmm, no internal rotation of the hip here either; in fact, even less than the right. Again, FEMORAL RETROTORSION. 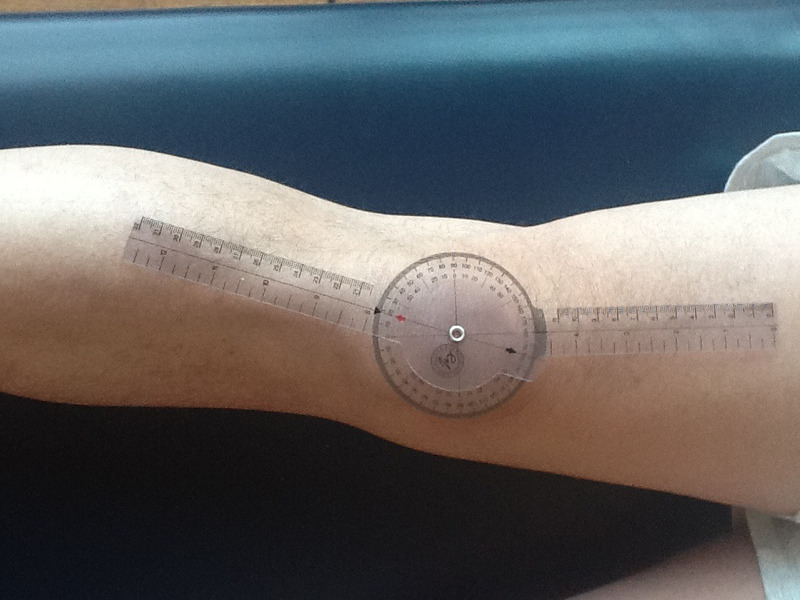 In the bottom two pictures, the goniometer is aligned with the ASIS and tibial tuberosity. I am not sure if you can see it, but it is 18 degrees on the left and 20 on the right. Normally the Q angle is between 8 and 12 degrees. This person has developed compensatory GENU VALGUS. Does it surprise you he has pain on the outside of his feet? How about knee pain? The Gait Guys. Making it real, every day, every post, every PODcast. all material copyright 2013 The Gait Guys/ The Homunculus Group.